…wen Ai can an Ai sai dat Cheezland iz teh best! Ohmai! A tie wif yurself, yu can has wun! Congas, anni! *nodnod* An we wurry when yu duz nawt! Fan club, yu can haz wun! Aw shukks! Ai juss hab moar tiem 2 spend heer dan moast peepls! Um…iz dat a lyon dere? Shuddnt kitteh bee gittin inn teh kar? Grate pixure an kapshun Robin an happee almos birfday tew Cheezland!!! LiLi can has tiger called Tuffy an lion called Rory taht am her frenz since her waz a babycat. Tehy appeers in her lols nao an tehn, when her mom nawt making lols frum gallery pics. Tuffy am in wunna her gallery pics tuu. OOH ai nao noe nummer wun frum yestiday!!! An dat MQos am Y yoo Iz Cheezlans bestest Ajent !!!! Teehee. An da mostee faborite wun too!!! Smooches to yoo. Whut Bluesfan sed n congas tu Annipuss tu ! *Wispurrs* Teh pichshur am awlso a kloo, aifinkso (tu yesterdai’s puzzlol) ! Fanku, Prysma. Iz jus a nimaj ai fownd on teh interwebs n *koffs* borroed fur teh partee. (Ai wil gib it bak afterwurdz, ai promiss) ! Hae, iz teh nawt-sekkund kitteh from yesturrdaiz puzzlol! Ai wunnered teh saym fing. Cannawt comment on taht, til teh ansurs fishully am up. Ai nawt allus cah minntz onna da Cheezland edder, but wen ai duz eet iz to sai: Dat iz wun beautimour kitteh! Anna hur leetlol fwen 2!!1! 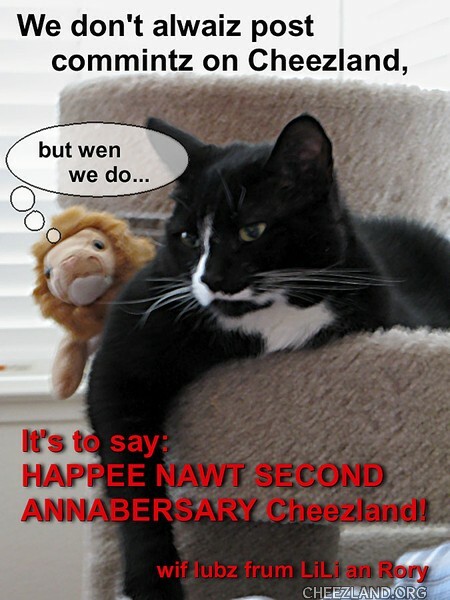 Happitailol Nawt Sekkint Annibirfdaibersery Cheezland! Ohai, ICHA! Teh wunnerfull fing abowt lolspeek is dat we awl noes whut yoo meens. Ai agrees wiv yoo abowt awl teh gudgud stuffs adn peeps in Cheezland. *Clinkys own shampers glass wiv ladykitteh’s* Heer heer! *passes glasses ob shampers tew alla peeps* chee(r)z! Wanna try a diffrint gaym? I finded a few onlion (an hadda run kwik tu get inna car!) taht I finked mite wurk on Cheezland. We can duz wurd assosiashuns? Start wuf a wurd, an yu say teh nawt-sekkund fing (nawt NB fing!) taht pownses intu yur hed! (Gibbon teh Cheezpeeps minds, this shud go in inneresting direkshuns, aifinkso!) When it winds daon, or wheneber, ennywun can start nuvver chain, if it wurks. *gigglol* Aifinkso this game too eezy fur cheezpeeps! Lemmee guess – ebree pawsiblol train of thot am gonna leed wifin a cupple steps tu cheezburgers? Dunno – mebbe him did / duz. Onlee noms refrinse coming tu mind am fish sticks an custard. BUT (!) TAS AM a kitteh, an kitteh thots oftin turn to noms from parintly unrelaytid subjekts, I has observed…. Tom Baker Dr Who luved jelly baybees, iffen ai bememburr korektlee! yup, iz bideo awn yoochoob bowt it. Weeeee….. Weeze in a pokkit nooniberse spinnin offa da loop! Gotta go for a bit – will duz my best to be back fur teh nekst post.